We can confirm that there is a 15% PrettyLittleThing student discount. To get it, head to this page on prettylittlething.com, validate your student status and you’ll be issued with a unique voucher code. However, there is currently a PLT voucher code for 20% off which you can get on the website. But wait there, it’s possible to SAVE EVEN MORE. Before you read our full guide, check out our quick savings below which has the latest promo codes, sales, offers and deals! Is there a PrettyLittle Thing Unidays, NUS or Student Beans Discount? We love PrettyLittleThing here are squirrel towers. There is fabulous fashion, dreamy dresses, tremendous tops and a whole lot more besides and the prices are friendly too. PrettyLittleThing has established itself as one of the premier online fashion retailers in the UK right now. They have a great range of ‘cute and affordable fashion’ for the 18 to 25 year olds as explained by Alex Prout. We kept on getting asked ‘Does Pretty Little Thing do a student discount?’. So we wrote this guide to answer both this query and to show students how they can save more. We’ll show you not only how to get the 10% promo code, we’ll show you lots of other clever ways to save on your fabulous PLT fashion purchases. Great news, we can confirm that there is a student discount for PrettyLittleThing in 2019. The standard saving is 10% off but we’ve seen that occasionally it get’s raised for a limited time. Check out our quick savings section at the top of the page for the latest news. Go to this special student page on prettylittlething.com. Validate your student status with Unidays and you’ll be issued with a unique voucher code. When you’re at the online checkout enter the promo code. Your amazing reduction will be applied. Have a beaming smile for the rest of the day around campus! There are a few restrictions though which are laid out below. Unfortunately you can’t use the student code on sale items. Some retailers actually allow this but you’ll be getting a big reduction anyway so we thing fair enough. There are also a small number of lines including premium collection, the 50 range and beauty items. And here comes a ‘Top Squirrel Tip’. However we’ve researched other ways of saving and it’s possible to get even more money off. Read our next chapter to find out how. So we’ve established that there is a PrettyLittleThing student discount. But did you know that there are more ways that you can save? Let’s get on with and show you how now! Did you know that there is a dedicated sales page on prettylittlething.com. It’s laid out really well, divided into sale sections by item such as dresses, knitwear, tops etc. There was up to 60% off when we were last there so there are plenty of bargains to be had. Also there is a useful sales filter so you can search by size, colour etc which makes find a deal even easier. This is a quick tip but retailers usually put their best offers on the homepage and PrettyLittleThing is no different. We’ve noticed deals such as dresses from £8, unlimited delivery for £9.99 and links to sales. Students often forget to do this but it’s well worth a look. The best way for students to get the biggest discounts at Pretty Little Thing is to shop when there is a big sale on. This is around Black Friday, Christmas when the winter sales begin, Easter time and the spring sale and summer for the big summer sale. We’ve written a whole chapter on it further down so check it out for dates and the other smaller sales. It is now possible to get free delivery at PLT. It’s called Super Save and takes from 7 to 10 days. There is also some other cheap options if you need it sooner and PLT Royalty which is unlimited next day delivery for £9.99 – great for those shoppers who use prettylittlething.com a lot. 3. Is there a PrettyLittleThing UNiDAYS, NUS Totum or Student Beans Discount? Now that there are a lot of different student discount schemes in the UK and it can become increasingly difficult to find out where to get your Pretty Little Thing student discount. Never, fear the little Student Squirrel is here to let you know just what you can get at 3 of the biggest players in the market: Unidays, NUS and Student Beans. So first off it’s good news in the that there is a Unidays PrettyLittleThing discount available. To get it you need go to this page on prettylittlethings.com, follow the instructions and you’ll be issued with the Unidays code to enter at the online checkout. Then a delicious 10% (sometimes more) will be taken off all full-priced items. Is There a PrettyLittleThings NUS Totum Discount? Unfortunately there is no NUS PrettyLittleThings programme. HOWEVER, NUS students by default will be able to get the Unidays code as described above. Few, that was a close one! Are there Student Beans Discounts at PrettyLittle? Nope, there is no association between Student Beans and PLT. This would make things easier for students, but you can still get discount through Unidays as described above. Also, make sure you check out our quick savings section for even more ways to save. So we established that there is a 10% PLT student discount promo code. But did you know that they also release voucher codes throughout the year that everyone, including students can use. So you can see that you can actually save more. Usually you can’t use the student code with any others on prettylittlething.com but it’s always worth trying, you never know your luck. Did you know the number one way that students can get the biggest discounts at PLT? “If you’re savvy and plan your budget well, you can get savings of 50% and more! The biggest sales happen around the same time each year. Check the dates below as if one if coming up it might be best to hold on. There are always lots of juicy reductions to be had at prettylittlething.com around Black Friday week. This week is usually around the last week of November and often goes over into December as retailers fight for you Christmas spend! This is a great time to shop for dresses and outfits for christmas parties (oh and getting people presents of cours). The Christmas sales are traditionally a huge time to get some of the best discounts we’ve seen. The timings have changed in recent years and after the last delivery day for Christmas PrettyLittleThing start reducing their autumn winter stock. There are some great reductions on dresses, tops, trousers, skirts, footwear and accessories. As we pass Boxing Day further reductions are made. We always recommend that if you have your eye on something then you should buy it as stock runs out fast at this time of year. Around mid March PLT have a mid-season sale and also something for Easter too. We’ve found that they have a good 50% sale on selected items, and then add additional discounts of 20% on sale items so you can get up to 70% off. This is one of THE best times for students to bag a bargain. Around mid June the summer sales hit. PLT know that you’ll be updating your summer wardrobe so there are good discounts on summer dresses, shoes, tees and shorts. Everything for you to look fabulous on the beach! This off-the-shoulder number is flatting to any shape and size and gives a beautiful outline fitting for a night out or summer occasion! There’s an air of the Spanish Senorita to it and you don’t need to accessorize heavily; the dress speaks for itself and will work well paired with just plain coloured accessories. It’s made of 100% polyester for a figure-hugging flattering fit and can be machine washed (although avoid putting it in with whites the first time!). A bargain basic, this one-shoulder strappy cami is ideal to be worn either an under layer or standalone on hotter days or at the gym. More eye-catching than a standard crop top, this jersey fabric tee is something a bit different. Dress up a blazer, tailored trousers and heels for a night out, or team with leggings for a yoga class; it’s super versatile and for just three quid will see you through a whole host of uses and occasions! If you’re a tan-a-holic, SOSU’s fake tan mousse is for you: a risk-free way of goldening your skin and getting the glow you desire. Available in a variety of shades and tones to suit all, this mousse is applied topically directly to the skin and is best used with a tanning mitt for even coverage. The mixture is full of moisturiser to help prolong the colour and will fade naturally. What’s more, it’s completely vegan, paraben-cruel and made with cruelty-free ingredients: so this really is the best possible tan you could ask for! 7. More About the PrettyLittle Thing! You’ll have seen the TV adverts, spotted the outfits in magazines and probably shopped there yourself; but did you know that UK fashion retail website PrettyLittleThing is an offshoot of Boohoo.com? 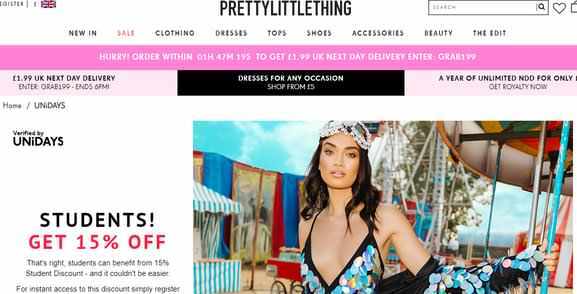 A fast fashion website aimed at 16-25 year olds, but often enjoyed by those a little older too, PrettyLittleThing has become a favourite amongst UK consumers looking for the latest fashions at great prices all year round. Using social media to grow and epitomise on the followers of minor celebrities, the first collaboration the site tried out was with ex-The Only Way Is Essex star Lucky Mecklenburgh, before moving to a US-focus and working with Kylie Jenner. Now, the site operates in the UK, France, USA, Ireland and Australia. PrettyLittleThing understand the power of social media, and so you can shop direct from their social feeds as well as through their website. Browsing ‘The Edit’ will give you style and outfit inspiration, but you can also shop in the more traditional method of by garment; through Clothing, Dresses, Tops, Shoes, Accessories and Beauty products. There’s also a great Sales section full of bargains, as well as Occasionwear and ranges for Plus Sized shoppers too. A Student Discount Squirrel favourite, the online store is a mid-range priced retailer but also offers a 10% student discount across all full-priced products as standard! The Sales section is also worth a browse periodically and is regularly updated with new items and discounts. You can save on delivery with numerous options too; and if you’re a regular shopper with the site, we’d recommend forking out on a £12.99 one-off payment for a year’s worth of free Next Day Delivery. Cheaper options are available if you don’t need your parcels quite as quick, including the UK Super Saver at just £1.99 (but quick! You’ll need to order at least a week in advance!). If you’re a bit of a social media guru, then you may be able to make some extra cash with PrettyLittleThing by becoming an Affiliate. This involves you advertising and promoting PrettyLittleThing’s clothes, shoes and other products online, and then if people who see your post purchase through your dedicated links, you’ll earn up to 10% commission on each sale! If you blog, are studying fashion or have a decent social media following, this may well be worth you looking into as a nice way to make a little extra dollar whilst indulging one of your interests. The Affiliate scheme is limited, however, and the site reserve the right to choose who they work with, so make sure your social media feeds are looking well curated and clean before you submit an application. PrettyLittleThing is much more than just a pretty face, with an ever-changing product range and loyal fan following. Browse the site now for inspiration! PrettyLittleThing was founded in 2012 by brothers Umar and Adam Kamani. Originally an accessory-only website, the brand grew with demand and started offering womenswear and shoes almost immediately. Marketing cheaply by utilising social media, PrettyLittleThing grew notoriety by being worn by minor celebrity affiliates, mainly reality TV stars, and then hitting the big time when papped on bigger names such as Miley Cyrus, Nicki Minaj, Rita Ora and Michelle Keegan. Working on celebrity collaboration ranges proved popular and collections so far include those designed with the likes of Kourtney Kardashian and Kylie Jenner. In 2016, PrettyLittleThing teamed with both ASOS and Lipsy to sell their products through the website, as well as a limited amount of Next clothing. It was early 2017 when the Kamani brothers sold the majority stake in their company to Boohoo.com, who until then had been a fierce competitor of the brand. The acquisition was viewed as almost universally positive for the retailer, and by November of the same year had been named one of the top three fastest growing fashion companies in the world. Long may it continue; we’re sure great things are in store! The brand is aimed firmly at the student market – typically from 16 upwards! The mains HQs are in Manchester!!!! It was founded by 2 brothers in only 2012! The brand is popular with lots of celebrities including – Miley Cyrus, Michelle Keegan, Jessie J, Rita Ora and Nicki Minaji! In June 2018 it launched a collaboration with presenter Maya Jama! In 2017 it was named as one of the fastest growing fashion companies by Hitwise!